In my last post, I examined ways to make bicycling in District 23 safer and more enjoyable and I also invited the candidates for District 23 to "steal" these ideas. Today, I'd like to look at what can be done to improve the parks in the district. I have to say, if you live in District 23, you're probably here for the parks or for the schools - or both. District 23 is defined by two large parks: Alley Pond Park and Cunningham Park. I don't know if it’s true, but a representative of a neighboring district once told me that District 23 has the most parkland per resident of any council district in the city. Cunningham Park already has a great (and very effective) advocacy organization—Friends of Cunningham—so I am going to keep my comments limited to the other parks. Improve access to the ‘Upper Alley’: If you live in Glen Oaks or Floral Park and want to walk or ride your bike to the Soccer fields, Adventure Course or Picnic Area of the Upper Alley you really can’t. (There is a backway using the Motor Parkway - but you'd have to know your way around the park trails to do so). The access road to the park takes you under the Grand Central Parkway and up a fairly sizeable ramp - there’s no sidewalk or bike lane here. And quite frankly, it’s a shame that this is how you are welcomed to one of New York City's premier parks. Ideally, any improvement will connect the pedestrian and bicycle paths in both the upper and lower Alley. There's no sidewalks at the entrance to the Upper Alley Pond Park. Restore the Alley Pond Overlook: Alley Pond Park has an overlook that is entirely covered in thorns and the pedestrian path to the overlook is in terrible shape. Assuming you find the pathway up and brave the bramble you're presented with a beautiful view looking south into Queens Village. The Parks department needs to clear the overgrowth and restore the overlook. Funds will need to be allocated to restore the pathway up to the overlook. Study Restoring the Alley Pond Pedestrian Paths - Alley Pond Park had a very beautiful partially-paved pedestrian path that would take you from the “Upper Alley” to West Alley Road and 233rd Street, along the Cross Island Parkway, but it has fallen into disrepair. 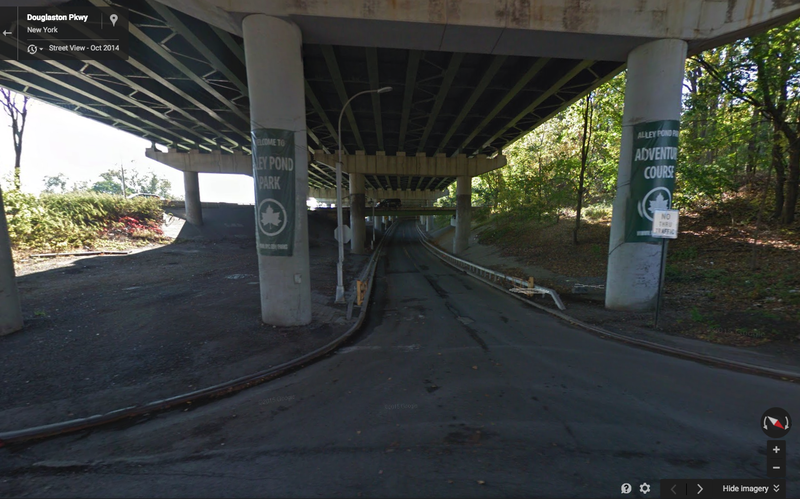 Study Restoring the Bridle Paths: There are a set of Bridle Paths along the Grand Central Parkway that lead from Cunningham to the Potamogeton Pond Park in Hollis Hills - but they once extended to Alley Pond Park. The paths could be restored with proper lighting and paving as a pedestrian and bicyclists trail that makes getting to Alley Pond Park easier for folks who live in Queens Village and Hollis.